NOTE! We have a number of 3D Puzzles for sale this week! Hi, my name is Kim and I am from Ontario Canada. 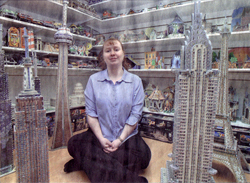 3D Puzzles were one of my largest passions. I had been collecting 3D puzzles for almost 14 years. The first Puzz 3D that I every received was the Victorian Mansion when I was in my teens. It was a beautiful puzzle and didnt take long to put together. After that I started receiving 3D puzzles for Christmas and Birthday's. Once I got a job and was able to purchase them on my own. I began to seek out the hard to find and rare puzzles. It had taken a few years, but at one point in time I had owned 287 Puzz 3D's. I enjoy every Puzz 3D puzzle regardless of size. I even had a whole room dedicated to Puzz 3Ds and have built custom shelving to hold all of them. I hope you enjoy looking at my collection and I hope you come back often. Check out the world map of Puzz 3D! Download technical diagrams for many of the puzzles and easily look for Puzzles to buy directly on the information pages.